For people interested in Erdnase it is interesting to note that at the beginning of the card trick section Steinmetz uses the uncommon idiom "gift of the gab" just as Erdnase uses it at the beginning of the legerdemain section in his The Expert at the Card Table . Both write it with quotes. The overlap in vocabulary is not limited to this one phrase. There are also extra textual similarities which are surprising. It suggests that Erdnase was familiar with and perhaps even fond of this book by Steinmetz. CHAPTER I. Chevaliers D’industrie, Or Polite Sharpers. CHAPTER II. Professional Gamesters And Their Frauds. CHAPTER III. 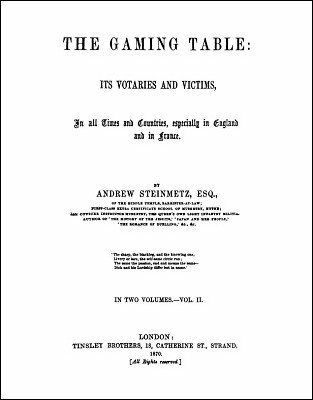 Anecdotes Of The Passions And Vicissitudes Of Gamesters. How Many Gamesters Live By Play? CHAPTER IV. Atrocities, Duels, Suicides, And Execution Of Gamblers. CHAPTER V. Oddities And Witticisms Of Gamblers. Of What Trade Is A Gaming-House Keeper? CHAPTER VI. The Gaming Clubs. CHAPTER VII. Doings In Gaming Houses. Cards That Would Beat The D—L Himself! CHAPTER VIII. The Doctrine Of Probabilities Applied To Gambling. CHAPTER IX. The History Of Dice And Cards. CHAPTER X. Piquet, Basset, Faro, Hazard, Passe-Dix, Put, Cross And Pile, Thimble-Rig. CHAPTER XII. The Turf, Historical, Social, Moral. CHAPTER XIII. Fortune-Telling By Cards (For Ladies). CHAPTER XIV. Amusing Card Tricks. 1st edition 1870, 444 pages; PDF 180 pages.